Happiness Project #66: Chocolate Peanut Butter Waffles! 6 weeks. 6 weeks later and this recovery is no fun. This past week has been rough. Emotionally, physically & psychologically. It’s been nearly 3 months since I’ve been able to pick up, run around with or be with my Daughter during the day. And missing my Baby Girl is slowly killing me inside. Which results in anger, frustration and a lakes worth of tears. Tears which could quite possibly reverse the current drought that California is in. Wishful thinking, at least. So naturally, since chocolate is a girl’s best friend (when the going gets tough), I was determined to create something yummy AND cheer-worthy. All for me today. Forget this menopause weight and always drowning myself in fruits and vegetables. This Mama wanted chocolate and peanut butter. Substitutions not welcome. Hence this super easy, to DIE for waffle combination. And a little bit of edible happiness on this Tuesday afternoon. 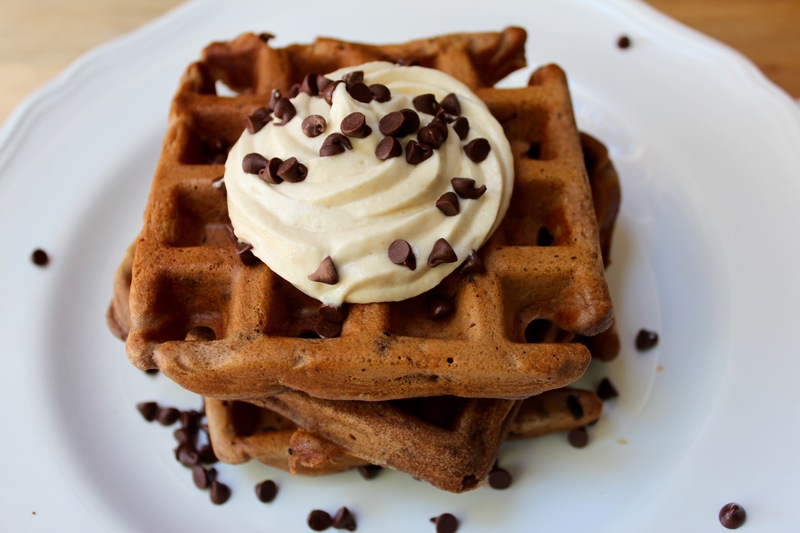 Break out that favorite waffle maker! Preheat accordingly. In a medium sized mixing bowl, whisk together the flour, cocoa powder, baking powder, baking soda and salt. Set aside. In a large bowl, on a stand mixer (or by hand held), combine the eggs, butter, vanilla extract and buttermilk. Stir, on a low setting, until just combined. Slowly add in the peanut butter. Add in the flour mixture to the peanut butter mixture, mixing well. Sprinkle or stir in the mini chocolate chips. And onwards to those waffles! Using either a large spoon or a 1/2 measuring cup, scoop in the waffle batter. Bake each batch of waffles until the edges are crispy and the center of each waffle is slightly firm to the touch. Or just smell your way to the perfect texture! I do. Once all of those lovely waffles are ready for consumption, pour, sprinkle or frost away! I’m a huge frosting snob & will add frosting to just about everything and anything so these waffles were no exception. And since there’s no such thing as too much peanut butter, well, you get the idea. In a large bowl on a stand mixer (or by hand held), beat in the softened butter and peanut butter, on medium speed, until fluffy and smooth. Drop the mixer speed to it’s slowest speed and add in the two cups of powdered sugar. Once well mixed, add in the vanilla extract, followed by up to 4 tablespoons of whole milk. Mix on a high for 3 to 4 minutes. And FROST! With MORE mini chocolate chips! Because chocolate chips, people. So now, whenever you too, are having an off kind of day, here’s a little something to perk you up. « Happy National Ice Cream Day! Summer Ice Cream Round Up: 2015! I love my waffle maker and these sound so YUM. Thanks for the recipe it’s getting pinned to my breakfast board! These waffles sound fantastic!! Definitely going to try to make some this weekend! My husband would LOVE LOVE LOVE these waffles! Tweeted! These look delicious and remind me of my childhood. My mom always used to throw some chocolate chips in my waffles. I love them! Such a great recipe! Waffles are my favorite and these look yum!! Thanks for sharing! I slobbered just reading the title! Can’t wait to try these!!! YUM! Oh my goodness. This looks so delicious! These sound fabulous! Waffles are one of my favorite breakfast/dessert/anytime of the day foods. Add chocolate & peanut butter…my, oh my! Oh my goodness I need this is my life like right now. Looks delicious and great photos!